This is a transcription of the Widow's Penison claim of Elizabeth (Surname not given) "Bockus" "Rundell" of Delmar. On this 8th day of December 1891, before me the Clerk of the Court of Quarter Sessions, a Court of record within and for the County and State aforesaid, personally came Elizabeth Bockus to me well known and whom I certify to be reputable and credible, who being by me duly sworn make the following declaration in order to be restored to the pension rolls of the United States as the widow of Eleaser Bockus, who was a private of Co. AG@ 45th Regt. Penn Vols. Who is now deceased. That her age is 46 years, her residence Delmar township, Tioga Co., Pa. Her Post Office Stokesdale, Pa. That on the 31st day of October 1891 a widow=s pension Certificate No. 312,301 was issued to her by the Court of Pensions as Elizabeth Bockus, now Rundell, formerly widow of said Eleaser Bockus, deceased. That she has drawn pension under such certificate from the 24th day of April 1874 the date of the death of said Eleaser Bockus to the 2nd day of April 1876, the date of a purported remarriage by her to one Amos D. Rundell, which said remarriage by her to said Rundell, she supposed and believed at the time and for a considerable time thereafter to be a valid and legal marriage, and that she was legally the wife of said Amos D. Rundell, She at the time of such remarriage not knowing or believing that there was any legal bar or reason existing why such marriage was not, or could not be in every respect a legal and valid one. That subsequently to the time of such marriage or purported marriage between herself and said Rundell, she learned that said Rundell had a wife living, and from whom he had never been divorced or in any other way legally separated as her husband; and that therefore the marriage between herself and said Rundell was void and absolutely of no effect or validity as a legal and binding marriage and that notwithstanding such marriage she was still the legal widow of said Eleaser Bockus, and not the legal wife of said Rundell. That upon knowledge of the fact that said Rundell had a wife living from whom he had never been legally separated, causing to her she applied to the Court of Common Pleas for the County of Tioga State of Pennsylvania, the County and State of her residence, for a decree of the Court dissolving the purported marriage, entered into as aforesaid on the 2nd day of April 1876, between herself and said A. D. Rundell, which decree of dissolution of said marriage , was on the 2nd day of March 1891, granted and made of record by said Court, and since the date of which said decree she has resumed the name, and been known by the name of Bockus, and is, and remains, the widow of said Eleaser Bockus deceased. That her children by her said husband Eleaser Bockus, who were under sixteen years of age at the time of his death, to wit George H., Emma J. And Rose, are all now living. That she hereby appoints D. L. Deane of Wellsboro, Pa. Her attorney to prosecute this claim. Also personally appeared before me at the same time and place C. E. Brewster, residing at Wellsboro, Tioga County Penna and O. L. Butts residing at Wellsboro, Tioga County, Penna, persons whom I certify to be reputable and credible and to me well known who being by me duly sworn do say that they were personally present and saw Elisabeth Bockus the claimant sign or make her mark to the foregoing declaration, that they have every reason to believe from their acquaintance with said claimant that she is the person she represents herself to be and that they have no interest in this claim. Sworn to and subscribed before me by the claimant and the witnesses the Th day of December 1891 and I certify that the claimant and the witnesses well understood the contents of the statements signed by them respectively before swearing, and that I have no interest in this claim the words Athe@ or Aintentionally@ and Aor@ erased before execution and swearing--also the words Aat the time and underlined and the word Eleaser in two places written on erasure before signing and swearing. Rose Bockus aged about 15 years. I have known the above named children since their birth and I knew that they are all alive at this time. I have always heard ____________ near ___ who is the above named Elizabeth Bockus and to above named children. And affiant further states that he has no interest in this claim. I was an Asst. Surgeon of the 45th P. V. I remember a soldier named Bockus (or as I think it was spelled on our hospital register Bacchus). He was regarded a good soldier but became ailing in the latter part of 1863 and frequently came to Asick call@ I think his ailment was aphonia from Bronchial or Laryngeal disease. He disappeared from my notice late in 1863 and I do not remember what became of him but believe he was furloughed. I do not remember his company or first name. I think I could not have recollected him except from the fact that we used to have some merriment at finding so sober, stand and excellent a man,, bearing the name of the god Bacchus. That he was a private in Co. A 187 Pa. Vol. That he came home to said county on a nine day furlough about the first of April A. D. 1864. That when he went back to join said Company and Regt. He met the said Elezer Bockus at Tioga. Tioga County State of Pennsylvania and traveled in company with said Elezer Bockus from Tioga aforesaid to Harrisburg, Pa. This was about the last of April a. D. 1864. Said E. Bockus was unable to speak a loud sound he had almost lost his speech. He was sick, looked very bad, very pale and very thin in flesh. I was corporal of above company and was acquainted with Elezer Bockus who was a member of my ___ Co. I know positively that said Bockus was disabled by a trouble with his throat and lungs while with his said Company. I think the latter part of 1863. I know that he was so disabled for the reason that he lost his voice and was unable to speak above a whisper for a long time. On this 22nd day of Dec. A. D. 1888, personally appeared before me the undersigned authority Elizabeth Bockus now Rundell who being duly sworn makes this declaration in order to obtain a Pension provided by the Act of Congress approved July 14, 1862. That she is the widow of Eleazer Bockus who was a member of Company G in the 45th Regiment of Penna. Volls. In the War of 186l; that she was married to said Eleazer Bockus on or about the 9 day of September, 1866. SHE FURTHER DECLARES that her said husband, died on or about the 24 day April 1874 of disease contracted while in the service of the United States. She also declares that she has remained a widow ever since his death and that she has not in any manner been engaged in, or aided or abetted, the rebellion in the United States; and she hereby appoints P. J. Lockwood, of Washington, D. C., her true and lawful Attorney. Her Post office is Stokesdale County of Tioga State of Penna. Also personally appeared Lewis A. Green residing at Middleburg Tioga Co. Pa. And Gibson Niles residing at Delmar Tioga Co. Pa. Persons whom I certify to be respectable and entitled to credit, and who being duly sworn, say they were present and say Elizabeth Bockus now Rundell the claimant, sign her name (or make her mark) to the foregoing declaration; that they have every reason to believe from the appearance of said claimant and their acquaintance with her, that she is the identical person she represents herself to be; and that they have no interest in the prosecution of this claim. That she is the mother of Mrs. Augusta Rundell who was married to A. D. Rundell in her presence at the house of Albert B. Rundell in Corning, State of New York in the year 1871 as she remembers by a Methodist minister, the Rev. 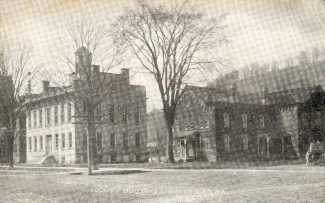 Clark C. Heard; That said A. D. Rundell lived with his said wife Augusta at Corning aforesaid for some two years after such marriage, when he deserted her, and came off toward Wellsboro, Tioga County, Pa. To live. That she has been informed that for some six or eight years or more of the time since said A. D. Rundell deserted his said wife Augusta, he lived with a Mrs. Elisabeth Rundell, to whom he was reported to be married, near Wellsboro, Penn. She further says that her daughter Mrs. Augusta Rundell, who was married to said A. D. Rundell as aforesaid, is still living at or near Lambs Creek, Tioga Co. Pa. And that she was never divorced from said A. D. Rundell to her knowledge, and she does not believe that her said daughter and said A. D. Rundell were ever divorced. She further declares that she has no interest in said case, and is not concerned in its prosecution. Rose was a baby at his death or at the remarriage April 21, 1876, of his widow. In the matter of claim of Elizabeth Rundell, or Bockus for restoration to the Pension Rolls as widow of Eleaser Bockus, late of Co. AG@ 45th Regt. Penn Vol. Infty. That in the years 1870 and 1871 she resided with her husband, Albert B. Rundell, who is now deceased, at Corning in the State of New York, That in the year 1871 (the exact date she is not able to give) A. D. Rundell, a brother of her husband, with whom she was then and has since been acquainted, was married by the Rev. Clark C. Heard, a Methodist minister to a Miss Augusta Luther, at the residence of herself and her husband, said Albert B. Rundell, in Corning aforesaid, and in the presence of herself and her said husband Albert B. Rundell. That said A. D. Rundell, and his said wife Augusta lived together as husband and wife for about two years at Corning N. Y. After which time said A. D. Rundell left his said wife and came up toward Wellsboro, Tioga County, Penna. And she afterwards heard that he had been married again and to a Mrs. Elisabeth Bockus. Deponent further says that she is still acquainted with Mrs. Augusta Rundell who was married to A. D. Rundell as aforesaid, that she lives at or near Lambs Creek, Tioga County, Penn., and that to the best of her knowledge and belief the said A. D. Rundell and Augusta Rundell have never been divorced or the marriage tie between them legally severed in any way. She further declare that she has no interest in said case, and is not concerned in its prosecution. I, I. M. Bodine, hereby certify, that on the lst, day of February one thousand eight hundred and Eighty six, at Stokesdale, Fremont Ferris and Emma j. Bockus were by me united in marriage, in accordance with license issued by the Clerk of the Orphans Court of Tioga County, Pennsylvania, numbered 59. County of Tioga, ) SS. I, Homer J. Ripley, Clerk of the Orphans Court in and for the said County and State do hereby certify the above and foregoing to be a true full and correct copy of the Certificate of Marriage duly filed and remaining of record in my office at No. 59, in Marriage License Docket No. L. Witness my hand and the seal of said Court at Wellsboro, this Third day of October A. D. 1892. Signed/ Homer J. Ripley, Clerk of C.
In ambulance train 2 Div. 9th A. C.
The records of this office furnish no evidence of disability. He is also borne as Eleazer Bockus.